← An urgent appeal… anyone know Keiron Barley? A probable 1940s church photo – with William Briggs highlighted in the centre. Can anyone put names to these people, or identify the church, or indeed the occasion? Image kindly supplied by Tony Briggs. I’ve received a fascinating enquiry from reader and friend of the blog Tony Briggs. If the name sounds familiar, Tony is the gentleman researching the history of St. Matthews mental hospital in Burntwood, who appealed for help with images of the now lost hospital a year of so ago. Tony sent me the above lovely photo, and other than his grandfather William Briggs being in the middle of the group, he knows nothing about it. He’s wondering if anyone can help him find more out about it, and maybe learn more about the life of his grandfather. Bit of a longshot this, but I was wondering if you could post the enclosed picture on your blog to see if anyone out there could identify the people featured. It is definitely local – it may have been taken outside the church in Chadsmoor, but I’m not sure. The picture was taken – I think – at some point in the 1940s. 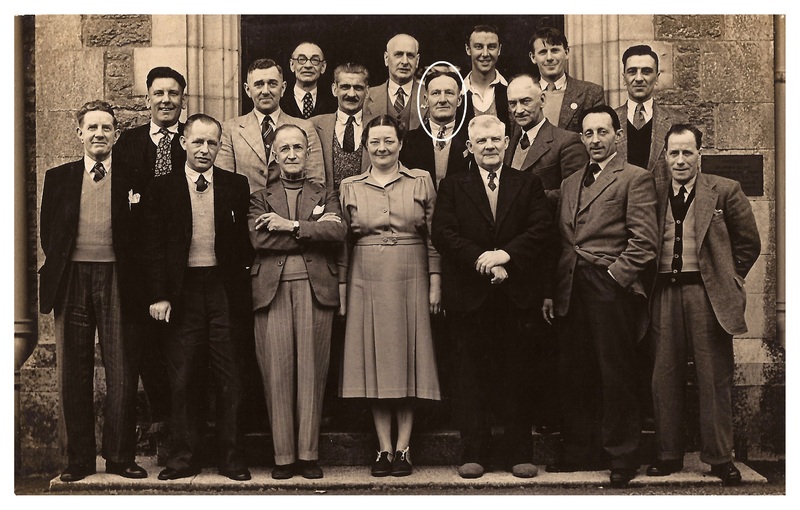 The only person I know in the picture is my Grandfather, William Briggs (I’ve circled him in the picture). Unfortunately, I know very little about him but have managed to find a few pictures and anecdotes from here and there over the past few years. He was a patient at St. Matthews hospital a couple of times, and that is what led me to compile the St Matthews picasa album you featured on your blog last year. I would really like to put names to the faces, and also try and find out the purpose of the picture if possible. As an even longer shot, if anyone out there remembers Bill Briggs from Huntington, 1903 – 1974 (for better or worse! ), I’d be delighted to hear from them. If you know anything about this, or indeed, have any memories of life at St. Matthews, please do comment here or drop me a line on BrownhillsBob at Googlemail dot com. Cheers. It really would be great if we could illuminate this bit of local history for Tony. This entry was posted in Cannock Chase, Churches, Events, Fun stuff to see and do, Interesting photos, Local History, Local media, News, Reader enquiries, Shared media, Shared memories and tagged 1940s, appeal, asylum, Bill, Briggs, Burntwood, Chadsmore, grandfather, Group, Hospital, Lichfield, Local History, Mystery, New Photos, photo, St Matthews, Staffordshire, Tony, William. Bookmark the permalink. I do not know the gentleman but was wondering if Tony has any connection to the Briggs family initially from Staffordshire. There’s a contact email address at the site above, so please drop me a line and we’ll compare notes.